This is just a basic little dynamo which uses a tiny 6V DC motor I scavenged from an old CD drive. I have grander plans for the motor in the future, but I thought it would be cool to use it to turn on an LED with it! The basic idea is pretty straight forward. If you take a motor, which has a permanent magnet in it, and turn the magnet on your own you will change the magnetic flux in the coil and as such start generating some current and, you will start to get a potential difference building up across the terminals of the motor. If I knew the RPM rating of the motor then I could figure out how fast to turn it to get a full 6 Volts. At the moment all I know is that I need to spin it pretty fast and the peak value my multimeter reads is 2.5 V, which is enough to power an LED. 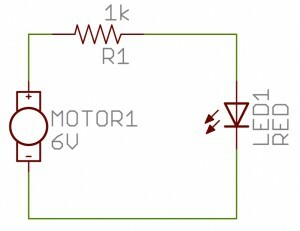 6V DC motor. I goa mine from a scrapped CD/DVD player. Appropriate Resistor for the LED (you want to calculate for about 30mA). I just used a 1k Resistor. The uses of this are actually pretty awesome. If you could hook up some gears and nice handles to the motor you could maximize speed and torque and make it easy to generate the voltage. This would allow you to crank the motor and turn this basic dynamo into a crank flashlight or even, with appropriate circuitry you could store charge up in a capacitor (or charge a battery) and build some cool crank powered circuits!